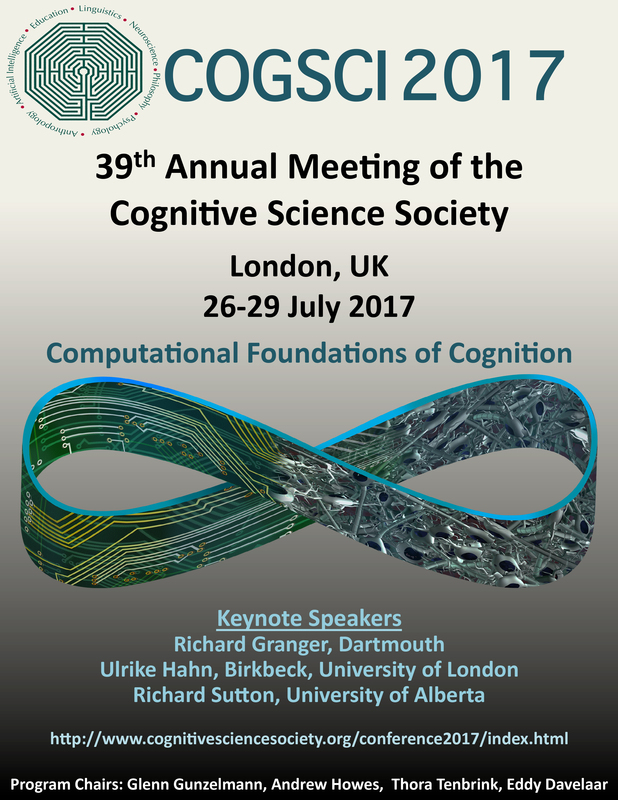 Research from the SysCog lab was showcased at the 39th annual meeting of the Cognitive Science Society held in London in July 2017. Emma Henderson presented her work on interactivity and planning and Fred presented a paper on insight problem solving and ego depletion. Planning is an everyday activity that is extended in time and space, yet is frequently studied in the absence of interactivity. Successful planning relies on an array of executive functions including self-control. We investigated the effects of interactivity and self-control on planning using a sequential-task paradigm. Half of the participants first completed a video-viewing task requiring self-control of visual attention, whereas the other half completed the same task without the self- control constraint. Next, and within each of these groups, half of the participants manipulated cards to complete their plan (high-interactivity condition); for the other half, plans were made with their hands down (low- interactivity condition). Planning performance was significantly better in the high- than in the low- interactivity conditions; however, the self-control manipulation had no impact on planning performance. An exploration of individual differences revealed that long-term planning ability and non-planning impulsiveness moderated the impact of interactivity on planning. These findings suggest that interactivity augments working memory resources and planning performance, underscoring the importance of an interactive perspective on planning research. In the triangle of coins problem coins are arranged to create a triangle pointing down and the solution involves moving a few coins to change its orientation. The task ecology can be designed such that participants can work on it in a low interactivity environment, maintaining a mental representation of simulated moves, or in a high interactivity environment, thinking with and through a physical model of the problem. These task ecologies involve working memory to a different degree: Problem solving draws more on working memory the lower the degree of physical interaction. Participants first engaged in a writing task that required vigilance to inhibit common word choices, a degree of self regulation designed to induce a so-called ego depletion; participants then worked on the ToC problem in either a low or high interactivity environment. Solution rates were determined by level of interactivity; the preceding depletion experience did not impact performance. The second edition of Cognition Beyond the Brain is coming out soon with new chapters from Gaëlle Vallée-Tourangeau (Systemic Thinking Model), Jens Koed Madsen (Multi-scalar Temporal Cognition), Alex Aston (Cognition Ecology and the Paris Commune), Kare Poulsgaard and Lambros Malafouris (Models, Mathematics and Materials in Digital Architecture). Enter your email address to receive SCL updates by email.